"In the courtyard of the apostolic delegation"
In the courtyard of the apostolic delegation. “Bp. 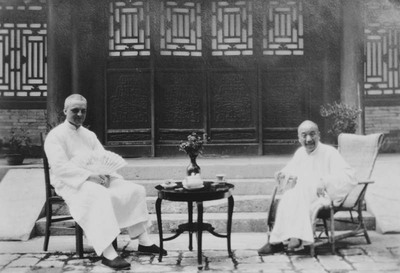 Tch’eng (of Xuanhua) after being released from hospital.” Fr. Paul Gilson, Bp. Pierre Tch’eng (Cheng程有猷). In the courtyard of the apostolic delegation. July 1933. Société des Auxiliaires des Missions (SAM) China Photograph Collection, Whitworth University Library, Spokane.